The Mandarin Institute in conjunction with STARTALK will offer a Chinese Teacher Preparation Program to teachers from the U.S. and the Greater China area. 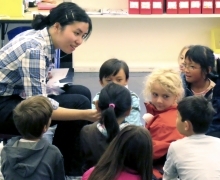 It is an unparalleled opportunity for new K-12 Chinese language teachers and teachers who are new to teaching in US classrooms, to gain concrete classroom experience teaching American students. Whether you are teaching in foreign language or immersion settings, during this intensive training, teachers will learn the critical skills they need to be innovative and successful in the classroom and to facilitate high quality Chinese language programming in their schools. Priority registration is given to teachers who demonstrate financial need. For qualifying teachers, the tuition fee will be waived. Program participants will engage in daily workshops led by master teachers addressing issues such as teaching in the target language, differentiated instruction, integrated performance assessment and classroom preparation. This program emphasizes “hands-on” training, ensuring that theory is presented in collaboration with the application for a comprehensive training experience. This training enables participants to practice what they have learned in authentic American classrooms with real students at the same level as they are going to teach. It will be followed by one-on-one mentoring sessions with lead instructors, and peer debriefing. Critical communication skills will be learned through interacting with real school administrators, teacher peers and parents. "This was a wonderful opportunity for me to learn and practice before I step onto the classroom platform of an American school. This program prepares new Chinese teachers with everything they need to be successful, such as psychological preparation, teaching and learning skills, classroom management and interaction with students." *All applicants requesting financial consideration must provide a letter from your head of school to demonstrate your financial need. The letter should include a statement of your school’s professional development funds and a well-detailed explanation of why the school is unable to provide the necessary financial support for your professional training. Online registration is closed. Contact Benson Zhao bzhao@MandarinInstitute.org (415)861-0966 for more information.